a) Do you believe in the existence of a Supreme Being? c) Do you seriously and upon your honour declare that uninfluenced by mercenary or other unworthy motives, and unbiased by the improper solicitations of friends, you freely and voluntarily offer yourself a candidate for the mysteries of Freemasonry? Initiates are required to pay an Initiation Fee. Members are expected to pay Annual Dues and be actively involved in the working of their lodge. This requires a commitment of two to four evenings a month and the effort to study and understand Freemasonry's philosophy, history, ritual and practices. If you do not know anyone who is a Mason, contact a Lodge in your neighbourhood. You have, no doubt, heard of Freemasonry, and perhaps you have wondered what it is. It is natural that there should be some questions in your mind. This paper has been prepared for those who are not members of our Order, to inform them of the aims and purposes of our organisation. Our traditions go back over the centuries to the days of the "Operative Masons", the men who built the cathedrals, abbeys and castles in times long past. In the 17th century the need for such buildings declined, but the practices and customs of the Operative Craft left an influence on a new movement that began in the second half of that century. Groups of men began to meet occasionally in various places in England. Men who were not actually builders, but who evidently had some interest in the old Craft. Some, no doubt, had an actual connection with it. But these new groups had no direct concern with the building trade. It would appear that they were men of integrity who enjoyed fellowship in an atmosphere of mutual trust amid the bitter divisions of the time. In order to give a basic form to their meetings it seems they adopted certain of the traditions and practices of the operative or working masons, and were influenced by the Scottish operative and Lodges. They called themselves "Masons", and when a man was admitted as a member of a group or lodge, he was said to have been "made a Mason". In 1717 four such lodges that had been meeting regularly in London and Westminster decided to form a "Grand Lodge" and to elect a "Grand Master" as their head. As more Lodges were established in England they looked to this Grand Lodge for guidance. Thus over the years regulations were set up to govern the Craft, a Constitution was adopted, and the simple ceremonies of the earlier years were elaborated until they became the three degrees or steps which we now have. It was in this way that what we call Speculative Masonry gradually evolved. From England Freemasonry spread to other countries where Lodges were formed, and eventually Grand Lodges were set up. There are now about 150 Grand Lodges in the world, with a total membership of nearly six million. One of these is the Grand Lodge of B.C. and Yukon, with 167 Lodges and almost 18,000 members. From very early times Freemasonry has provided an opportunity for men to meet and enjoy the pleasures of friendly companionship in the spirit of helpfulness and charity, and guided by strict moral principles. Its members are encouraged to practice a way of life that will sustain high standards in their relationships with their fellow men. In other words, the practice of Brotherhood. It is an organisation, which recognises no distinction between races, creeds, or social qualifications. The organisation of Freemasonry is based on a system of Grand Lodges, and each one is sovereign and independent within its own territory. There is no central authority governing all Freemasonry, but each Grand Lodge, in order to be "recognised" by the others, must maintain acceptable standards and follow established traditions and practices of Freemasonry. The Grand Master, with his officers, supervises the "constituent lodges", and each Lodge and member is required to observe the regulations set out in the Constitution. The Lodge is the basic unit of Freemasonry. Each year it elects its officers to manage its affairs. Through them the members are encouraged to achieve a better understanding of the ideals and principles of our Craft. It is through the Lodge that a man becomes a member of our Fraternity. When he has been accepted, he receives, over a period of time, the three degrees of Freemasonry. It is through these degrees that our teachings are mainly presented, as each one conveys a moral lesson. While Freemasonry has a religious basis, it is neither a religion nor a substitute for religion. Before he can be admitted a member, a man must profess his belief in a Supreme Being (by whatever name He is known), be of mature age and good moral character. Freemasonry does not go beyond that nor does it question a man’s particular faith or religious dogma. It does urge him to practice the religious belief, which he holds. Freemasons meet regularly in their Lodges for the transaction of necessary business, for fellowship, and for the discussion of matters of Masonic interest. They are pledged to preserve the moral fibre and quality of life, and to act in a spirit of helpfulness towards all men. They are taught to make Charity and Benevolence a distinguishing characteristic of their Masonic life. Our Grand Lodge has a number of charitable projects. It has its own Benevolent Fund, Community Charities Fund, and Bursary Fund, all built up by the contributions of our members. Freemasons do not appeal to the public for funds; all contributions come from our own resources. In this way an attempt is made to inspire our members with a feeling of charity and goodwill towards all mankind. The whole purpose and teaching of Freemasonry is communicated through the three degrees of the Craft Lodge. A member, however, may wish to extend his experiences of Freemasonry by participating in additional degrees such as the Scottish Rite, or Royal Arch Masonry. Through these he can become a member of the Shrine. The Shriners, through their colourful parades, their annual circus, and their work for crippled and burned children, are probably the best known to the public. However, to become a member of any of these bodies a man must be, and remain a member of his Craft Lodge. Since membership in the Masonic Order is for men only, there are various women's and youth organisations, which may require sponsorship by Masonic Lodges, or for those who are relatives of Freemasons. The aims of these groups have an affinity with Freemasonry. Freemasonry does not interfere in their workings and is not responsible for their actions. From time to time the Grand Lodge of British Columbia and Yukon has deemed it desirable to set forth, in precise form, the Aims of Freemasonry as consistently practised under its jurisdiction since it came into being as an organisation in 1871, and also to define the principles governing its relations with those other Grand Lodges with which it is in fraternal accord. It is necessary to emphasise, again, certain fundamental principles in the Order. The first condition of admission and membership to the Order is a belief in a Supreme Being. This is essential and admits of no compromise. A Holy Book, referred by Freemasons as “The Volume of the Sacred Law”, is always open in the lodges. Every candidate is required to take his obligation on that Book. The Book is from the religion practiced by that individual. And imparts a sanctity to an oath or promise taken upon it. 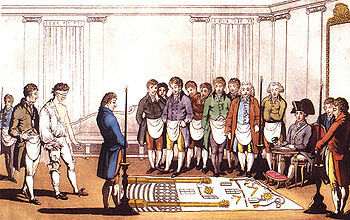 Everyone who enters Freemasonry is, at the onset, strictly forbidden to countenance any act which may have a tendency to subvert the peace and good order of society; he must pay due obedience to the law of any state in which he resides or which may afford him protection, and he must never be remiss in the allegiance due to the Sovereign of his native land. While British Columbian Freemasonry thus inculcates in each of its members the duties of loyalty and citizenship, it reserves to the individual the right to hold his own opinion with regard to public affairs. But, neither in any lodge, nor at any time in his capacity as a freemason, is he permitted to discuss or to advance his view on theological or political questions. The Grand Lodge has always consistently refused to express any opinion on questions of foreign or domestic state policy either at home or abroad. It will not allow its name to be associated with any action, however humanitarian it may appear to be, which infringes its unalterable policy of standing aloof from every question affecting the relations between one government or another, or between political parties or questions. The Grand Lodge is aware that there exists bodies, styling themselves as Freemasons, which do not adhere to these principles, and while that attitude exists, the Grand Lodge of British Columbia and Yukon refuses absolutely to have any relations with such bodies, or to regard them as Freemasons. The Grand Lodge of British Columbia and Yukon is a Sovereign and Independent body practising Freemasonry only within the three degrees and only within the limits defined in it constitutions as "pure Ancient Masonry". It does not recognise or admit the existence of any Superior Masonic authority, however styled. The Grand Lodge of British Columbia and Yukon will refuse to participate in conferences, with so called International Associations, claiming to represent Freemasonry, which admit to membership Bodies failing to conform strictly to the principles upon which the Grand Lodge of British Columbia and Yukon is founded, nor can any such International Association represent its views. There is no secret with regard to any of the basic principles of Freemasonry, some of which have been stated above. The Grand Lodge of British Columbia and Yukon will always consider the recognition of these Grand Lodges, which profess, and practice, and can show that they have consistently professed and practised, those established and unaltered principles, but in no circumstances will it enter into discussion with a view to any new or varied interpretation of them. They must be accepted and practised wholeheartedly and in their entirety by those who desire to be recognised as Freemasons by the Grand Lodge of British Columbia and Yukon. The United Grand Lodge of England has been asked if it stands by the Aims and Relationships of the Craft. The United Grand Lodge of England replied that it stood by every word of the declaration, and has since asked for the opinion of the Grand Lodges of Ireland and Scotland. A conference was held between the three Grand Lodges, and all unhesitatingly reaffirmed the statement that was pronounced in 1938: nothing in present day affairs has been found that could cause them to change from that attitude. The Grand Lodge of British Columbia and Yukon and the three Grand Lodges of England, Ireland and Scotland are convinced that by a rigid adherence to these Aims and Relationships, that Freemasonry has survived the constantly changing doctrines of the outside world, and are further compelled to place on record their complete disapproval of any action which may tend to permit the slightest departure from the basic principles of Freemasonry. They are strongly of the opinion that if any Grand Lodge does so; it cannot maintain a claim to be following the Ancient Landmarks of the Order. The Three Grand Principles of Freemasonry are brotherly love, relief and truth. Perhaps before explaining these three, one should first look at the meanings of "Grand" and "Principles"
Therefore, Brotherly Love, Relief and Truth can be regarded as the most important and noble rules for the guidance of a Mason's moral conduct. These Grand Principles have been in existence for hundreds of years, indeed one document from 1775 states that a mason is "strictly to obey the moral law", and further enjoins him to "act honourably to all men" not just Freemasons. This, as understood by a Mason, is more than a belief; it is a reality and offers men a philosophy for their life's guidance. It enables them to enjoy harmony and fellowship with men of all nationalities and classes. A Mason is taught to regard the whole human species as one family his family. By this, masonry unites men of every country, sect and opinion, enabling them to enjoy true friendship. In one part of our ritual, it is called "disinterested friendship" friendship for the sake of being that person's friend, with no hidden or avaricious motives. Brotherly love is placed as the first of the foundation principles of freemasonry, because where pure disinterested love exists among men, there can be found harmony and goodwill. This gives ease, removes or lessens some cause of distress, affords aid, helps a person in time of poverty, gives assistance in time of danger or difficulty. It is the second grand principle on which the order is founded, and is brought to the attention of every man during his admission to the Craft. The Ancient Lectures state that it is a duty incumbent on men, particularly Masons. On this basis we establish our friendships and form our connections. Every man made a Mason professes a sincere desire to "render himself more extensively serviceable to his fellow creature". What can this mean, other than extending relief, in any form, to our brother, our neighbour, indeed any man who may require or desire it, as liberally as his necessities may require and our abilities permit. The moral teachings of Freemasonry are of no value unless put into practice. It is also a measure of comfort to every Mason to know that if his path becomes difficult, brethren, in remembrance of their Masonic teachings and obligations, will come to his assistance, without thought of personal reward. Indeed, relief perhaps could better be described as "benevolent relief”. Brethren are also encouraged to seek their own relief by looking inward to the “Great Architect of the Universe” or by whatever name their own religious persuasion may call Him. Freemasonry is non-sectarian in nature, allowing men of all religious persuasions to join. Masonically, truth is defined as "a Divine attribute, and foundation of every Masonic virtue". This virtue is taught at every initiation. Hence, hypocrisy and deceit ought to be unknown, and sincerity and plain dealing is characteristic of a good Freemason. This has a practical bearing of the daily lives of Freemasons. Truth must be differentiated from knowledge. It is the basis of character, enabling us to understand ourselves, and thereby be better men. The quality of being true is exemplified in what ought to be the character of a Freemason; integrity, uprightness, sincerity, and fidelity. These, and thus truth, embody the highest ideals we can weave into life. The entire philosophy of Freemasonry is built around the individual; the building of a moral edifice within the heart of a man. The first Grand Lodge, the first in the world, was founded in London, England in 1717. • At the Goose and Gridiron Alehouse in St. Paul's Churchyard. • At the Crown Alehouse in Parker's Lane neat Drury Lane. • At the Apple Tree Tavern in Charles Street, Covent Garden. • At the Rummer and Grapes Tavern in Channel Row, Westminster. "They and some old Brothers meet at the said Apple Tree, and having put into the Chair the oldest Master Mason (now the Master of the Lodge) they constituted themselves a Grand Lodge pro Tempore in Due Form, and forthwith revived the Quarterly Communication of the Officers of Lodges (called the Grand Lodge) resolved to hold the Annual Assembly and Feast, and then chuse (sic) a Grand Master from among themselves, till they shall have the Honour of a Noble Brother at their Head." "Accordingly, on St. John Baptist's Day, in the 3rd year of King George 1, A.D. 1717, the assembly and Feast of the Free and Accepted Masons was held at the foresaid Goose and Gridiron Ale House. Before dinner, the oldest Master Mason (and now the Master of a Lodge) in the chair, proposed a list of proper Candidates; and the Brethren by a Majority of Hands elected Mr. ANTHONY SAYER Gentleman, Grand Master of Masons (Capt. Joseph Elliott, Mr. Jacob Lamball, Carpenter) Grand Wardens, who being forthwith invested with the Badges of Office and Power by the said oldest Master, and installed was duly congratulated by the Assembly who payed him Homage. Sayer Grand Master commanded the Masters and Wardens of Lodges to meet the Grand Officers every Quarter in Communication, at the Place that he should appoint in his Summons sent by the Tyler." The original No. 1, that met at the Goose and Gridiron is now known as the Lodge of Antiquity No. 2 the Grand Master's Lodge is now No. 1. The original No. 3, that met at the Apple Tree Tavern is now known as the Lodge of Fortitude and Old Cumberland No. 3. The original No. 4, which met at the Rummer, and Grapes Tavern is now known as the Royal Somerset House and Inverness Lodge No. 4. There is much which has been written of these old Lodges Nos. 2,3, and 4 since that time, but this is all there is written about the formation of the first Grand Lodge. All other Grand Lodges about the world have been formed since that date. Most Grand Lodges have their roots stemming from this Grand Lodge. In England, since 1717, there are now over 8,240 Lodges with 83 different Grand Lodge appointments. In British Columbia, there are 167 Lodges with 59 Grand Lodge Appointments. Since the Grand Lodge of British Columbia and Yukon is so young, it is fortunate that we have a relatively well-documented account of the early formations of Lodges in the British Columbia Colonies and Vancouver Island Colony before the establishment of the Grand Lodge of British Columbia and Yukon. This paper will attempt to give the history of the lodges formed in the very young province before that event. As in other Grand Jurisdictions around the world, our Ancient Order grew with the economic development of the Province. In early times that economy was based on fur trade. This trade declined in 1858 when the first great gold rush to the Province began. The first suggestion of Freemasonry emerging on Vancouver Island was actually in a carrying case of a Dr. Tolmie who moved to Victoria in 1859. It is not certain if Dr. Tolmie was a Freemason, since there are no records of his being involved in any Masonic activities around this time. Through the hands of several relatives, this same case is now in the hands of Prince of Wales Lodge #100, it being last in the possession of Dr. Frank Patterson, a member of that Lodge. The members of the Ancient Order of Free and Accepted Masons in good standing are invited to meet on Monday July 12th, at 7:00 o' clock p.m. in Southgate and Mitchell's new store, upstairs. Victoria Lodge of F. and A.M. Preliminary measures have been taken for the establishment of a Masonic Lodge in Victoria. The petition for a charter will go to England on the next steamer. The following gentlemen have been named as office bearers: Capt. Southgate, W.M., George Pearkes, S.W., William Jaffray, J.W., A. De Cosmos, Secretary, J. N. Thain, Treasurer, W.H.Thain, S.D., R.J. McDonell, J.D. Victoria Lodge No. 1085. Our Masonic Brethren will be pleased to learn that the Charter applied for to the Grand Lodge of England has arrived and is now in possession of J.J. Southgate, Esq. Arrangements are now in progress to speedily organise the Lodge in "due and ancient of which the Brethren will have "due and timely notice". The constitution, installation and investiture of officers took place on August 20th 1860, in the upper storey of the Feardon Building, otherwise known as "Stationers Hall". The installing officer was W.Bro. Henry Aguilar, RX, Past Master of Good Report Lodge No. 158, and who was commanding H.M. gunboat "Grappler", then stationed in Esquimalt. Also participating in these ceremonies was W.Bro. Robert Burnaby. He had affiliated with the newly formed Lodge, which practised the "Emulation" or "English" work. The second Masonic Lodge in the Province was established in New Westminster, as Union Lodge No. 1201, E.R. Remember at that time British Columbia and Vancouver Island were separate colonies. Perhaps Union Lodge can boast of being the first British Columbia Lodge! It practised the "Scotch" or "American" work. The third Lodge to be formed was Vancouver Lodge No. 421, Scottish Registry, and once again on Vancouver Island. Dr. Israel Wood Powell, established this Lodge. He had been a member of Elgin Lodge No. 348, S.R. in Montreal. They practised the "Scotch" or "York" works. The organisational meeting was held on October 20th, 1862, when 8 brethren were present. In 1865, Nanaimo brethren made application to the Grand Lodge of England for a charter. The original charter was lost in the wreck of the Hudson's Bay Steamer "Labouchere" on a voyage from San Francisco to Victoria. Not until 1867 did the replacement charter arrive. The first communication of Nanaimo Lodge No. 1090 E.R. was held on May 15th, 1867. Brethren from Victoria attended the first lodge meeting by travelling on the steamer "Sir James Douglas" which was chartered for the occasion. British Columbia Lodge No. 1187 E.R. was next to be established with Caledonia Lodge No. 478 S.R. in Nanaimo followed by Quadra Lodge No. 508, S.R. in Victoria. Nine Lodges existed when there began talks of creating a Grand Lodge of British Columbia in 1871, but that's another story. Although Freemasonry is many things to many men it is, basically, an association of friends. It is a fraternity that admits to its membership men, of all races, creeds and colours, who have a belief in a Supreme Being. What, then, is the connection between religion and Freemasonry? A plain, simple answer is "There is no connection between the two any more that there is between religion and the Rotary Club or between religion and the Cancer Society." Haffner, in his book Workman Unashamed (available in the Grand Lodge Library) points out that Freemasonry lacks the basic elements of religion. It has no theological doctrine and, by forbidding religious discussion at its meetings, will not allow a "Masonic theological doctrine" to develop. Secondly, it offers no sacraments and, thirdly, he points out, it does not claim to lead to Salvation by good works, by secret knowledge or by any other means. We are interested in Faith only, not theology. When Freemasonry accepts a Christian or a Jew or a Buddhist or a Sikh or a Muslim or a man of any religious persuasion, it does not accept him as such, but as a man. When he joins Freemasonry, he brings with him his own religious background and allegiance. He is not subscribing to a new religion when he becomes a Freemason any more than he does when he joins the Boy Scouts or the Liberal Party. Some of the problems our critics have related to the writings of so called authorities that do not necessarily have their facts straight. There are so many differences between Grand Lodges that any information, written in a preface to a book such as a "Masonic Bible", claiming to speak for Freemasonry throughout the world needs to be checked carefully. One such book states that Freemasons believe they can attain everlasting salvation by doing good works. This is one of the oldest heresies in Christianity and. quite rightly; the Christian Church attacks this because it believes that the only way to obtain Salvation is through faith. This should remind the reader of the first round on Jacob's Ladder. Freemasonry, in this Jurisdiction, is not concerned with providing a means of salvation but regards this as something that each man will find within his own religion. If Freemasonry were a religion, there would be no need for Masons to attend church, synagogue, mosque or temple. One American evangelist contacted all the American Grand Lodges a few years ago and asked who they saw as the authoritative writers on Masonry. Twenty five of them replied naming people such as Pike and Mackey, whose names are the same ones that immediately occur to many British Columbia Masons as authorities on Freemasonry. These men wrote 150 years ago! Just as churches have changed in that time so has Freemasonry. The reader, who wishes to read a modern, well-researched book on this topic, is referred to the one by Haffner, mentioned above. If people want to throw stones, that's their business. In order to answer some of the criticisms, one has to stoop to the level of the critic. That is not the Masonic way. A man's relationship with God is his business. Freemasonry is wise to stay clear from such debate. You may have noticed on the letter you received from the Secretary of the Lodge, when you were invited to attend a meeting, that the name of your lodge was followed by the number of the lodge and then these letters, A. F. & A. M. What do these letters mean and how did they come to be associated with the Lodge name? The letters mean Ancient, Free and Accepted Masons. This title has not always been connected with the names of Lodges. The first Grand Lodge ever formed, was the Grand Lodge of England, in 1717. In 1730 a man by the name of Samuel Pritchard published an 'expose' called Masonry Dissected. Its contents were not completely accurate, though the Masons in London, fearing that impostors may attempt to enter their lodges with knowledge gained from this book, changed a few modes of recognition. This change incensed a group of Masons from Ireland and Scotland who could also not gain entrance because of the changes, changes they did not know. They felt some landmarks had been changed. By 1751, that group had established a rival Grand Lodge with its intent to return to the old Institutions. They called themselves "The Most Ancient and Honourable Society of Free and Accepted Masons." Later, they became known as the Ancients while the original Grand Lodge of England, formed in 1717 were known as the Modems. A final reconciliation of differences occurred in 1813 when the two Grand Lodges formed as one and were called "The United Grand Lodge of Ancient, Free and Accepted Masons of England. The origin of the difference between Mason and Freemason (if any) is unknown. The term Free probably had different implications at various periods of Masonic history. It may at different times have meant freedom from serfdom, freedom from town or borough regulations or, and this is more generally accepted today, it described a worker of freestone, a type of stone that can be readily cut and shaped with accuracy, as opposed to one who works in roughstone, which cannot be so shaped. (Eddie 1978 p. 17) Pick and Knight (1990,) state..."The earliest use of the word Freemason occurs in 1376, when it implies an operative mason of somewhat superior class ... During the seventeenth century a number of examples of the use of this word suggests that it was beginning to be applied especially to the non operative mason." Certainly this distinction applies today. Mackey (1907 p. 294) suggests the word free, in connection with a Mason, originally signified that the person so called was free of the company or gild of incorporated Masons. In the 10th century the term freemason appears to have been used when travelling freemasons were incorporated by the Roman Pontiff. In another sense free means not bound, not in captivity. It is not permitted for a man to be initiated into Masonry who at the time is restrained of his liberties. The Grand Lodge of England extends the doctrine that Masons should be free thinkers and allowed to express their thoughts and unrestricted in their actions. The word accepted might have originated with a London Masons' Company, an operative organisation that existed near the end of the fourteenth century. After the year 1619, records of this company show non operative masons, (speculative masons), joining. Within the London Masons' Company was an inner body called the "Acception" to which non members could belong. Elias Ashmole, an Englishman and Antiquary made reference in his diary that in 1646 he was "made a Freemason" in what was a purely speculative Lodge in Warrington, in Lancashire, England. In 1682 he records his attendance a meeting of the London Masons' Company when both Operative and Speculative members were present. Evidently it was possible for Gentleman Masons to become members without joining the Company. A small publication in 1676, 6 years before Ashmole's visit to the London Masons' Company, had printed a skit entitled "Poor Robin's Intelligencer" on the subject of the "Company of Accepted Masons". Today, most Lodges use these initials after the name of the Lodge. In United States of America and Ireland, lodges use the initials F. & A.M. and A.F. & A.M. depending whether they styled themselves after the Modems or the Ancients. (Mackay, A.G. Encyclopaedia of Freemasonry, Louis H. Everts & Co.